A new sign outside a bank in Framlingham has misspelt the name of the Suffolk town. 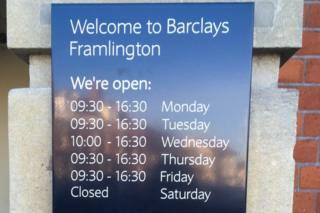 A photograph tweeted to BBC Radio Suffolk shows the sign says: "Welcome to Barclays Framlington". Framlingham is the home town of singer Ed Sheeran, who paid homage to its 12th Century castle in his song Castle on the Hill and lives nearby. Barclays Bank apologised for the spelling mistake and said it had requested an "urgent replacement". Kathryn Kitson, Barclays' community banking director for Norfolk and Suffolk, said: "We apologise to our customers and the local Framlingham community that the new signage plaque installed on our branch has a spelling mistake on it. "We have put in a request for its urgent replacement." Sheeran's brother Matt, visiting his home town from Bristol, said he thought it was "funny" but was not surprised when he heard about the sign. The classical musician and composer joked "I'm from Framlington" when he was introduced on BBC Radio Suffolk. He admitted he used to struggle to say the word "Framlingham" as a child. On 1 April last year, The Guardian ran an article as an April Fools' Day joke that talked about "a pretty town" called Framplington. Image caption Ed Sheeran's brother Matt said the mistake was "funny"